For the hors d’oeuvre, the Savory Mini Cheesecakes were a huge hit. This is something that will make many appearances at future parties. 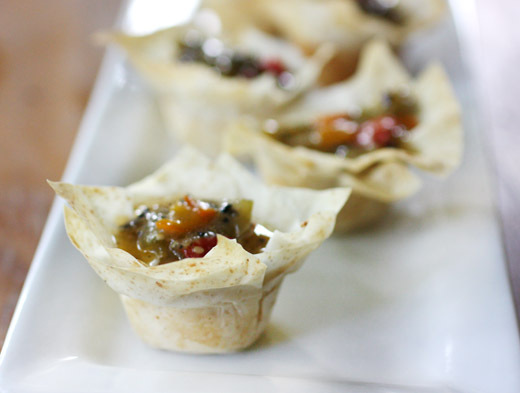 If you can find pre-made, mini phyllo shells, these will be even simpler to prepare. I didn’t find them, so I cut whole wheat phyllo sheets into small squares. I layered the phyllo pieces in buttered mini muffin pans and brushed butter between each layer of phyllo. The cheesecake filling is a mix of cream cheese, sour cream, and an egg. That was spooned into each phyllo cup, and they were baked for 15 minutes. After cooling for a few minutes, the mini cheesecakes were topped with a tangy, spice-filled chutney made with curry leaves, asafetida, cumin seeds, fenugreek seeds, fennel seeds, onion seeds, black mustard seeds, dried red chiles, chopped tomatillos, red bell pepper, grated fresh ginger, a little sugar, lemon juice, and salt. As the chutney simmered and the house filled with the scent of those lovely spices, I was thrilled to have chosen this dish to start the meal. The main course was one of those fabulous dishes that sits and simmers all by itself while you go about all the other things you need to do. To start, oil was warmed in a large saute pan, and a cinnamon stick and two bay leaves were added. Next, half a minced red onion, a few minced garlic cloves, and a couple of teaspoons of grated fresh ginger were sauteed until golden. I chopped, two big fresh tomatoes but canned tomatoes could have been used instead, and those were added next. The spices used here were a teaspoon of red chile powder, a teaspoon of ground turmeric, a tablespoon of ground coriander, and salt to taste, and those were added after the tomatoes had cooked for about ten minutes. A pound of boneless chicken that had been cut into big pieces was added and allowed to brown on all sides. I had two small, white eggplants from my CSA, so I chopped those into chunks and added them as well even though eggplant wasn’t part of the original recipe. After the chicken was browned, a cup of brown Texmati rice was added with two cups of water, and it was brought to a boil. The heat was reduced, the pan was covered, and the dish was left to do its thing for about 25-35 minutes. 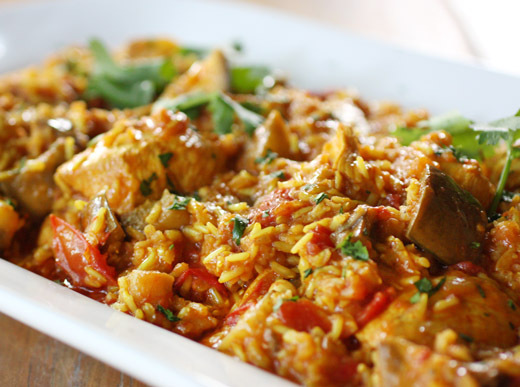 The rice should absorb almost all of the liquid and leave the finished dish only slightly moist. As the chicken and rice simmered, I set about cooking the side dish which couldn’t have been easier. Zucchini, yellow squash, and sweet peppers were diced. Oil was heated in a large skillet, cumin seeds were added, and as soon as the cumin sizzled, the vegetables were dropped into to the pan. After about eight minutes, the vegetables were tender, and red chile flakes and turmeric were added. Some fresh lemon juice was squeezed over the vegetables just before serving. Dessert was already made in advance, and all that had to happen was to scrape the granita into pretty glasses and top with some lime zest for garnish. The granita was made by pureeing fresh, peeled chunks from two big mangos, some honey, a pinch of crushed saffron, some fresh lime juice, and a half cup of champagne. The puree was poured into a shallow pan and placed in the freezer. Icy crystals were scraped every hour or so as the granita sat in the freezer. I’m still thinking about the sizzling spices and anticipating the flavors as each dish was started. The results were delicious from the start of the meal to the last bite of dessert. We were delighted to take part in a Worlds of Flavor meal. 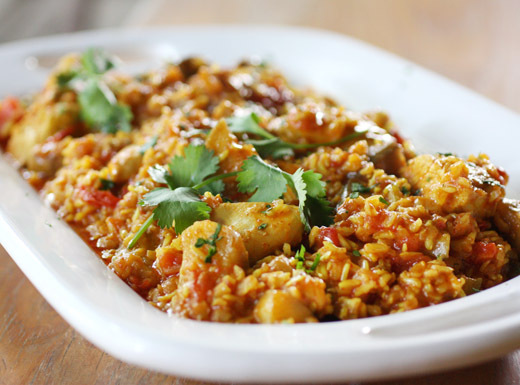 This post is part of the DailyBuzz Food Tastemaker program with RiceSelect. I received the sample of brown Texmati rice and a stipend. 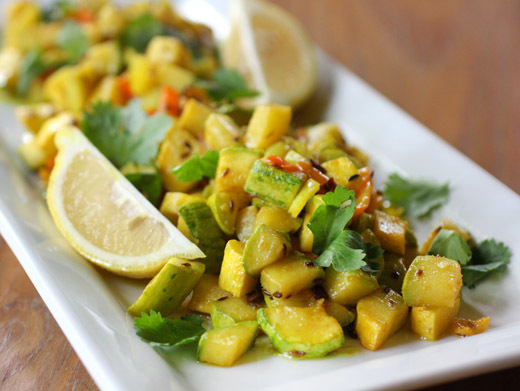 A marvelously flavorful and comforting dish! That combination is mouthwatering. Everything looks delicious. I really like the simple side dish. Will try it next time we have some grilled meat. Sounds like it would go well. You are one amazing cook Lisa! You always make it sound so easy and yet I know I would just bumble it up on my own. That rice dish looks very flavourful and simply scrumptious! These filo pastry hors d’oeuvre are great too. What a great selection! I love all the flavours you've got going on here and everything looks wonderful. What a splendid dinner party! Adore how all the dishes came together, while the main dish simmered you were free to engage with your guests. This looks fabulous. I wish I attended this party. Nice work. Those little savory cheesecakes look so adorable and very delicious!! I love the skillet chicken and rice. I might actually have enough talent to recreate that. cheesecakes of a savory nature and baked in a phyllo shell--tremendous! this is some incredible food, lisa! If you have any leftovers, I'll help you finish them! What a magnificent meal...you've outdone yourself here!!! Great presentation on that granita! And a totally lovely menu. Really excellent stuff - thanks. 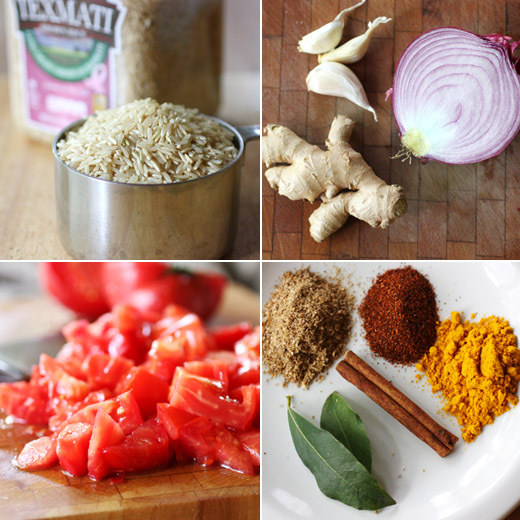 I really love the spices you have infused into the dishes! And oh my, your presentation is awesome, and the dishes look superbly scrumptious! what a beautiful, flavourful meal! Mouthwatering menu Lisa. Very professionally done! Wonderful flavors in every course, Lisa. Even the granita. Which looks delicious, BTW. 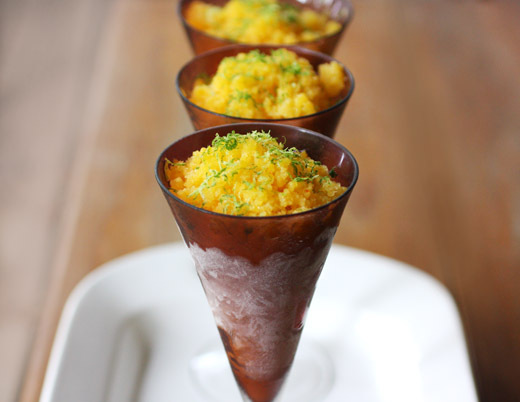 I love serving granitas for dessert...light and the perfect ending. Lisa, gorgeous menu! I wish I lived closer so I could be a guest at one of your dinner parties! Really nice photos. Not only does everything sound exciting in flavor, the colors of the meals are equal. I love theme dinners. That skillet chicken is a keeper.